Many of the foals born on the Abbey Thoroughbreds property are retained by their owners for racing rather than put through a sale, but we do provide a full sale preparation service for our clients. One of our yearlings who went through the Scone Select Sale in 2013 has had a fantastic start to his racing career after running second in the first 2yo race in Australia this season, the time honoured Romantic Dream Plate at Tamworth. 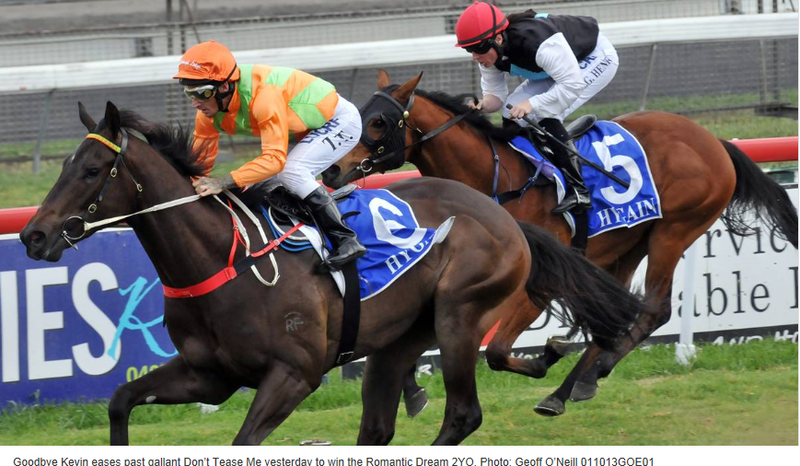 The colt (now a gelding) races under the name Don’t Tease Me. He is the first foal from the Invincible Spirit mare La Petite Coquette, and is by the ultra consistent sire Beautiful Crown. After being purchased by a long term client of our racing stables, Abbey Thoroughbreds retained a share in Don’t Tease Me with the colt being immediately broken in post sale by Jim Gleeson. Our breaking in process takes approximately 3 months as we are firm believers in needing to fully educate a young horse. This also includes an education at the track and out of the barriers, and after this they are generally ready for a 3-4 week break before we bring them back in again to continue the process. 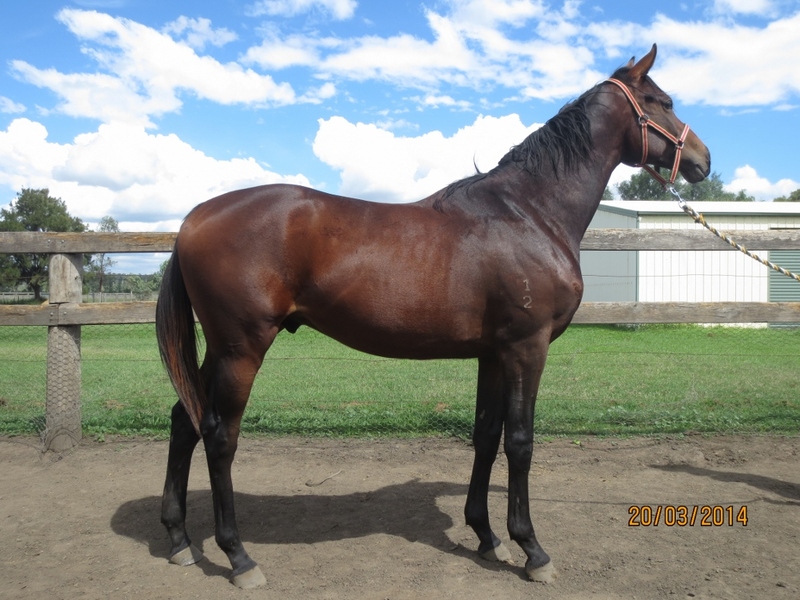 In the case of Don’t Tease Me, he was still proving a handful at the 3 month mark (not uncommon in the Beautiful Crown progeny) so Jim decided to keep him in work in an effort to make him more tractable when he finally made the racetrack. The last thing expected at the time was for Don’t Tease Me to be tough enough to handle the breaking process straight after the sale, a jump out, a barrier trial and then make a 2yo race at the end of September. Not only did he make the first 2yo race of the season, but he nearly overcame a slow start and a wide barrier to run second to Goodbye Kevin, who has subsequently gone on to run a close 3rd in the Group 3 Ken Russell memorial race for 2yo’s on the Gold Coast in May 2014. Having had a lot of success with the Beautiful Crown progeny, his trainer Stephen Gleeson believes his best days are ahead of him as they generally don’t make early 2yo’s. Abbey Thoroughbreds also believes the best days are ahead of Don’t Tease Me’s mother La Petite Coquette, who has another very attractive colt being prepared for this year’s Scone Select Sale in May 2014. By ill-fated sire Beneteau, this striking colt has just entered the stables in preparation for the 18th May sale that will coincide with the rich Scone Cup Carnival. The October foal was never going to be mature enough to sell to his full potential at the January Classic sale, so he was only entered for Scone to allow him a few extra few months to develop. The photo below shows the Beneteau – La Petite Coquette colt on the first day he arrived in the stable for his stable for his sale prep. We look forward to showing you more of him just prior to the sale, and judging by his good looks and temperament, and the results of the Beneteau progeny at this year’s sales, he will prove very popular with buyers.